This week's #TweetTheGeeks is no parody! This week’s #TweetTheGeeks is no parody! It seems like parodies are everywhere these days, but this week’s #TweetTheGeeks is 100% authentic. It seems like everywhere you turn there’s a parody: YouTube, iTunes, Spotify…the list goes on. This week’s episode, Episode 149 to be exact, is all about music, and our favorite genres of music. “Weird Al” reached the top of the charts last year with his latest album, but the parody genre tends to go unnoticed in the “big picture” discussion. 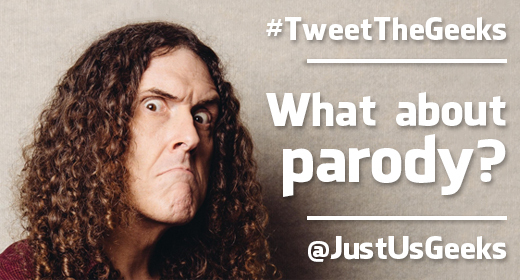 So, this week’s #TweetTheGeeks Question(s) of the Week: What about parody? Are you a fan? Let us know, and we’ll feature you on the this week’s episode of the podcast! @JustUsGeeks long as some are funny, I love em. But then EVERYONE parodies the same thing, and it gets old quick. @JustUsGeeks #tweetthegeeks I love parody. Especially when it’s thematic on top of just sounding similar. @alyankovic excels at that. Hello, nice post.I use google webmasters and “yahoo webmaster”, with yahoo is more easy, fast to remove old urls and directories. With Google its very dificult, and some urls need to have the 404 error.There are an easy way? Why google make this so hamadThanks,blue_meg.loraniac, i have the same problem but with dinamic contents “?” and the same “learn more”Why it is so hard,I also use Robots.txt, but google kept the urls in index.Any solutions? Adicionei aspas em “sessÃµes espÃ­ritas”, AndrÃ©. Pensei se deveria alterar o tÃ­tulo para “sessÃµes espiritualistas”, ou para algo completamente diferente, mas o fato de que tais prÃ¡ticas sÃ£o popular e amplamente conhecidas como “sessÃµes espÃ­ritas” e referidas como tal mesmo por alguns espÃ­ritas (deveria escrever “espÃ­ritas”), me fez adicionar apenas as aspas.Noto que na atualizaÃ§Ã£o do post, feita logo apÃ³s sua publicaÃ§Ã£o, jÃ¡ advirto sobre a diferenÃ§a entre espiritualismo e espiritismo.